These five funny quotes for volleyball setters created for VolleyBragSwag tshirts celebrate the best athletic and leadership qualities a successful setter has to have. Setters are the leaders of their teams and as most leaders in any sport do, they have to spend more time working on their craft especially since there are always two or three hitters on the court and only one setter. That one setter has to become good at communicating with different hitters, delivering the types of sets the coach and the players want. A good setter has to be able to remember where the weak blockers are on the opposing side of the net and to make sure that he/she has a hitter that can score, in front of that weak blocker. I've created a series of setter sayings and rhyming quotes that can be used as team chants, cheers or even slogans. These sayings have inspired many of the designs for my line of volleyball tshirts called the Volley.Brag.Swag designs. Volley.Brag.Swag designs are confidence building setter statements with fun sayings and original quotes that allow players in all positions including hitters, liberos, middles, and blockers to express confidence and pride in their playing talents. 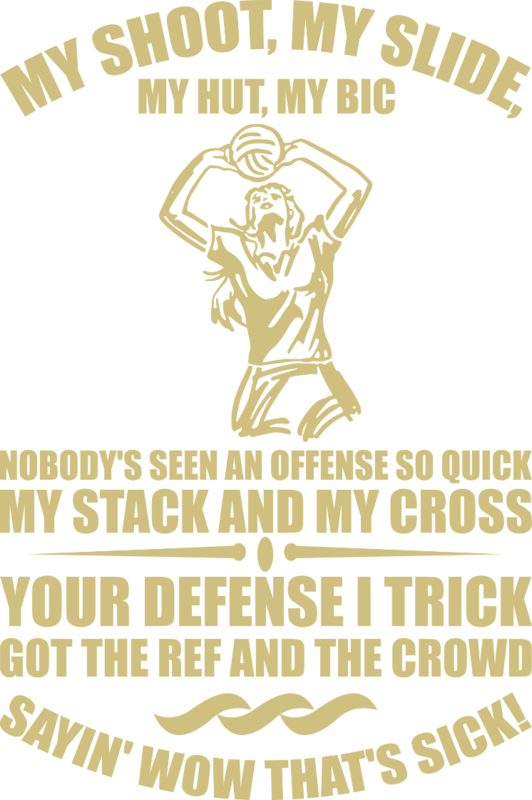 For my VolleyBragSwag tshirts, I create funny quotes for volleyball setters that I think give setters a fun way to build confidence and do a little bragging about their setting abilities regardless of their skill level. You can let your volleyball tshirt do the talking for you, so you don't have to say a word. If you're not getting the respect you think you deserve, then you should tell the world how you feel about your setting talents. This is a way you can generate your own self respect. All without moving a lip muscle...now go run tell that! 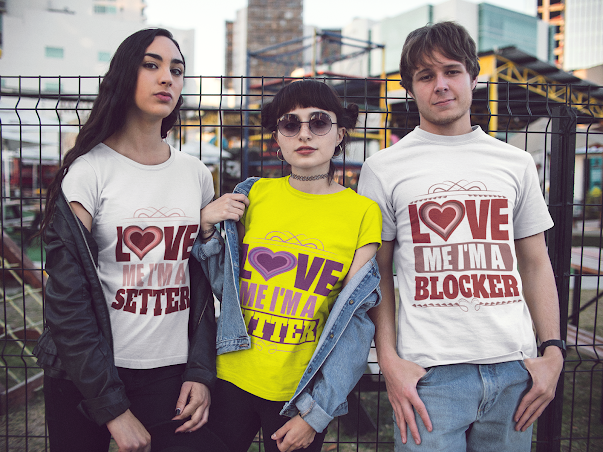 Get one of the American Apparel or Gildan shirts with the new setter slogans below. i force the Ref 2 say "That's Sick!" is what makes us so ssslick! 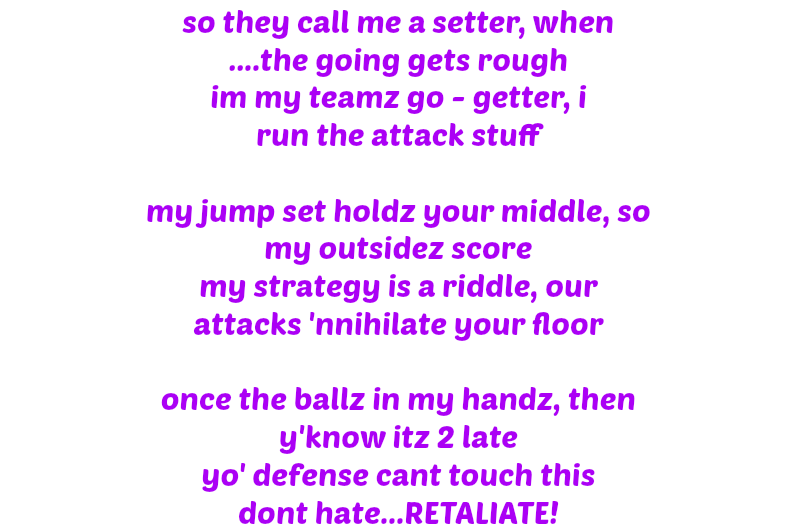 Here's another one of the VolleyBragSwag funny quotes for setters. Volley.Brag.Swag designs are original brag statements and volleyball sayings, slogans and quotes . These volleyball sayings allow players, regardless of their skill level to express confidence in their playing talents by showing the world how they feel about their abilities regardless of what others think and all without uttering a word. As I develop and complete more volleyball slogans, sayings and quotes I will share them here on this site. 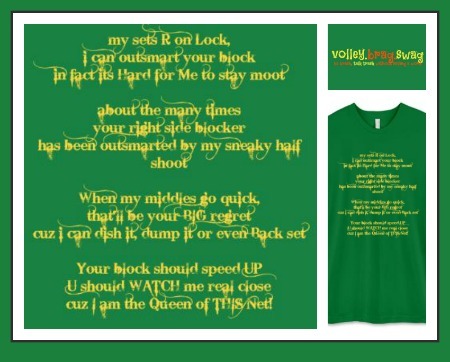 Visit volleybragswag.com for a volleyball tshirt with one of these and more funny quotes for setters on them. my sets r on lock I can outsmart your block in fact its hard for me to stay moot. about the many times your right side blocker has been outsmarted by my sneaky half shoot. when my middles go quick that'll be your BIG regret cuz I can dish it, dump it or even Back set. Your block should speed up. U should WATCH me real close. cuz I am the QUEEN of this net! 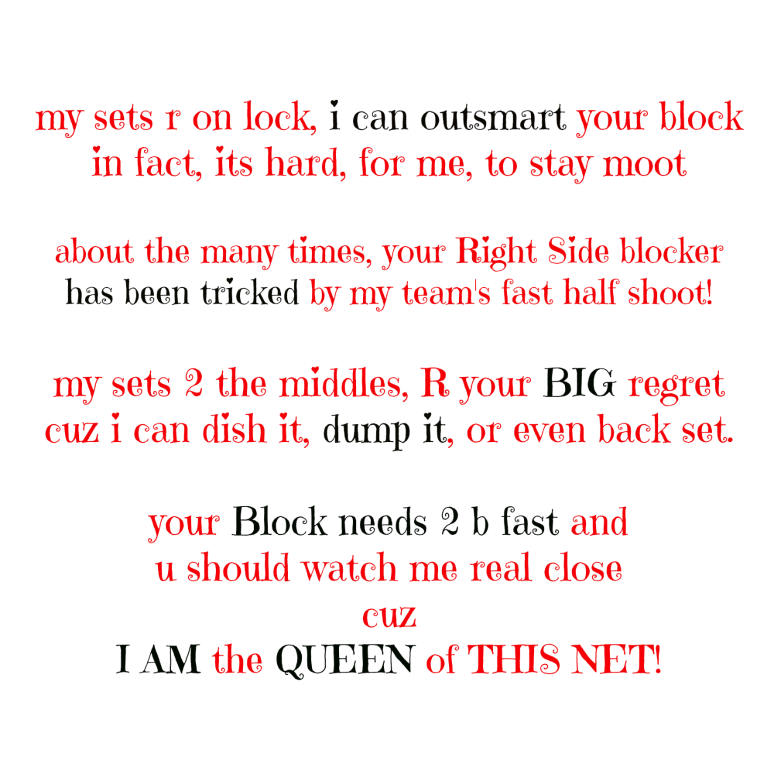 My sets r on lock you cant stop me with that block and other funny volleyball setter quotes on DearVolleyball.com. I AM the setting WIZ! 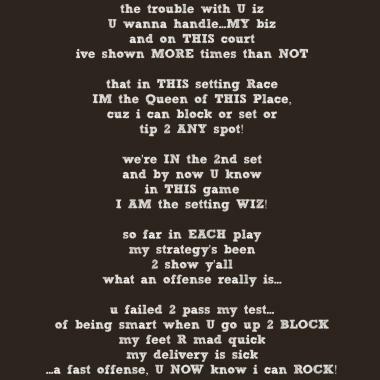 ...a fast offense, U know i can ROCK!